Milltown Memories 5: Take a Butcher's! 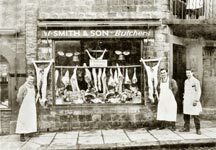 Willy Smith's - known rather more formally as W. Smith and Son - was just one of six butchers, counting the butchery department at the Co-operative Store, serving the good people of Luddendenfoot for much of the last century. Willy Smith's, just a few doors down from the Black Lion, had modernised and acquired cold storage facilities by the time this undated photo was taken. The Frigidaire sign is proudly displayed in the window, alongside the usual cuts of meat. Other butchers at that time included Frank Ashworth, Able Fletcher and H. Crossley and, of course, there was also the Economic Stores. Together they kept village folk well-fed and catered for. All that changed in the 1960s when much of the property, including Denholme Building where Willy Smith was situated, was demolished.